So, inspired by all of the other crafty bloggers in the world, I'm going to share my top 10 posts from 2012, you know, in case you might have missed one and will feel left out if we all show up and talk about it and you don't know what we're talking about. See, I'm thoughtful like that. 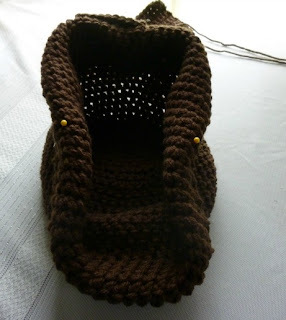 The project based on a crochet butterfly from my childhood is the number one most-viewed post of the year. It's also the post that inspired my friend Kristy to find a way to used crochet projects into her work with childhood cancer patients and the homeless/motel families in Orange County. I have been overwhelmed by the generosity of people all over the world who have made incredible crocheted donations to help us as we try to make the world a better place with crochet. Thank you! We love you all! I love this beret so much! In fact, I loved it so much that I put it on the cover of my very first book, Crochet Dynamite: Fancy Schmancy (available in the Kindle Store on Amazon.com. Software for your computer/tablet/smartphone is FREE!). It looks soooo good on everyone! I had seen so many scarf-based head wraps all over Pinterest that I got all inspired to make a crochet wrap for Mims and me. This was my first experience using Mims as a model, and she was delightful until I accidentally bobby-pinned her in the scalp. Then the photo shoot was much less fun. 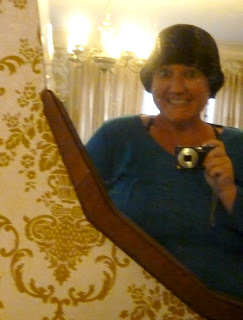 She still likes wearing the headwrap though, but as a headband now. This came out of my love of crazy colored hair. I love my completely unnatural pink/red hair, but it's hard to find styling aids that 'blend' in and look, um, natural... I know how it sounds, just let me have this. So when my bright pink bun was looking a little wimpy, I created this add-in to boost the oomph of my little bun so that it would be as dramatic and impressive as my personality! LOL!!! Jake's cousin Ro was having a baby shower, and I wanted to put a handmade present in with the stuff that I had picked out from her registry. Her baby, A, was due at the end of September, so I knew that he'd need a cozy hat for most of October whenever they left the house, so I created this Little Monster beanie to make Halloween Month more fun. It did! He even wore it as part of his Halloween costume! My sister-in-law S, not to be confused with my sister S, had a cute sewn lipbalm keychain that she carries everywhere. It had a zipper and was completely adorable. 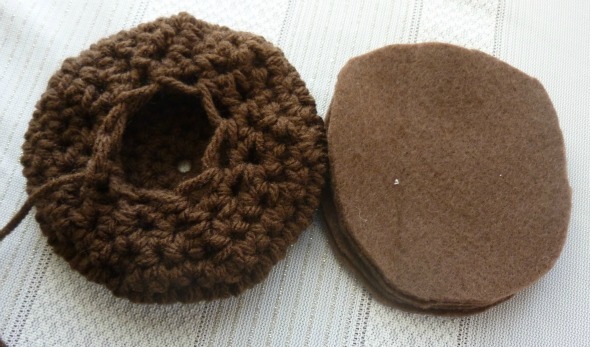 I wanted to see if I could make a crochet version that would be just as cute and functional. 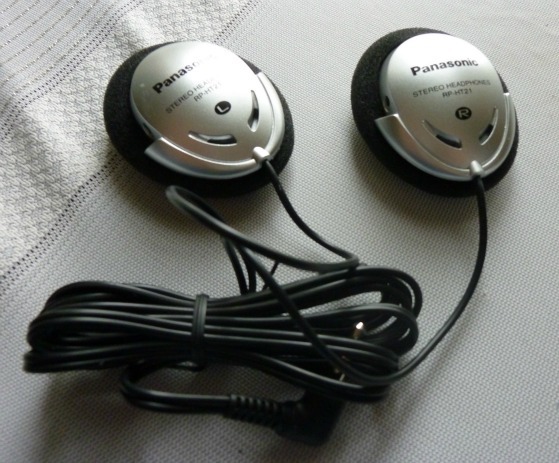 Turns out, it looked better (and worked better!) without the zipper! And now that I've been using mine for 6 months, I don't know how I lived without it! It's a must-have! This is the first project that I made that went viral. It showed up everywhere! There was a while where I couldn't go on Pinterest without seeing it several times as I scrolled through the DIY & Craft section. 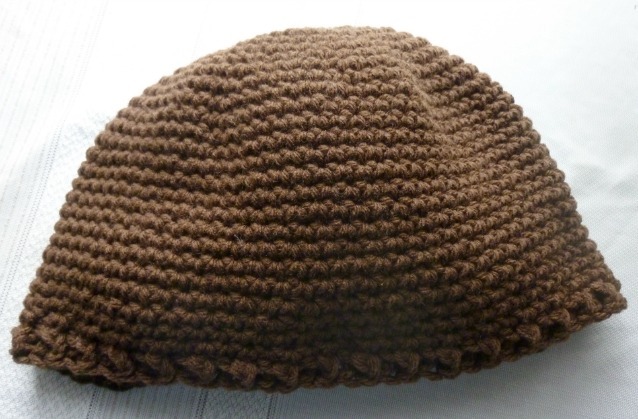 This pattern's success was what really gave me the confidence to keep designing and creating and building Crochet Dynamite. 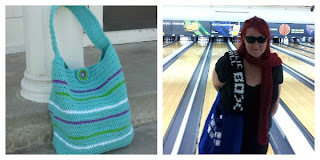 It also inspired the Tardis Bag, which is so awesome that I believe The Doctor himself would approve! 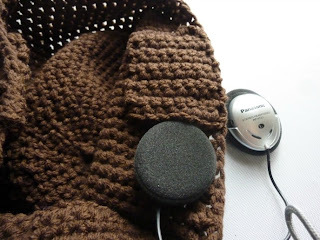 I like a project that you can use lots of different ways. A multi-tasking project, if you will. Something that is fast and easy, but still impresses the heck out of all of your friends. This is one of those projects. Mims still wears them in her hair! This project came out a very bad week, in a very challenging year. In fact, it was one of those weeks where it was hard to remember that good things happen too. I had watched a documentary about the positive things that happen when you focus on the positive things in your life, and I thought it was worth a try. I'm glad I did, because when I started carrying this little beanbag around with me, it reminded me to be grateful for what was going right in my life. And somehow, the stuff that was going wrong didn't seem so bad. Okay, so there you've got it! The Top 10 of 2012! Had you seen them all? Did YOUR fave make the list? I hope you all have a fun and safe New Year's Eve and I'll see you next year! So some of you who follow the Crochet Dynamite page on Facebook might have seen a post I did last night about adding advertising to my site. I've been reluctant to do it, honestly, since I didn't want to bombard you lovely Dynamos with ads that are obnoxious and irrelevant. But it has occurred to me that some of you lovely Dynamos have lovely businesses and you might like a place to promote them! Especially if that price was so good you couldn't NOT do it!!! That post promted a very long online chat with my good friend Aunty Teeni, of MadCrochetLab.com, about where this site is going, and what my plans for the future are. Do you have your 5 year goals written out? Yeah, me neither. But I'm going to make a resolution to do it next year... Anyway, back to my point, after talking with her about my future plans, I'm pretty sure that advertising will make it's way onto my site in the future sometime, but not right now. Why? Because I thought of something better, of course!!! For the month of January, let's have a button swap! Grab my button from the sidebar over there and put it on your site, then come back and tell me about it. 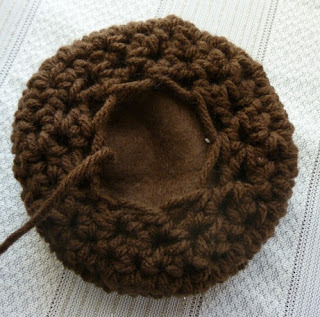 I'll go grab your button and add it to Crochet Dynamite. Sounds fun, right?! Free advertising for both of us! Besides, it's only for a month. And if we really love it we can keep the button love goin' on and on! 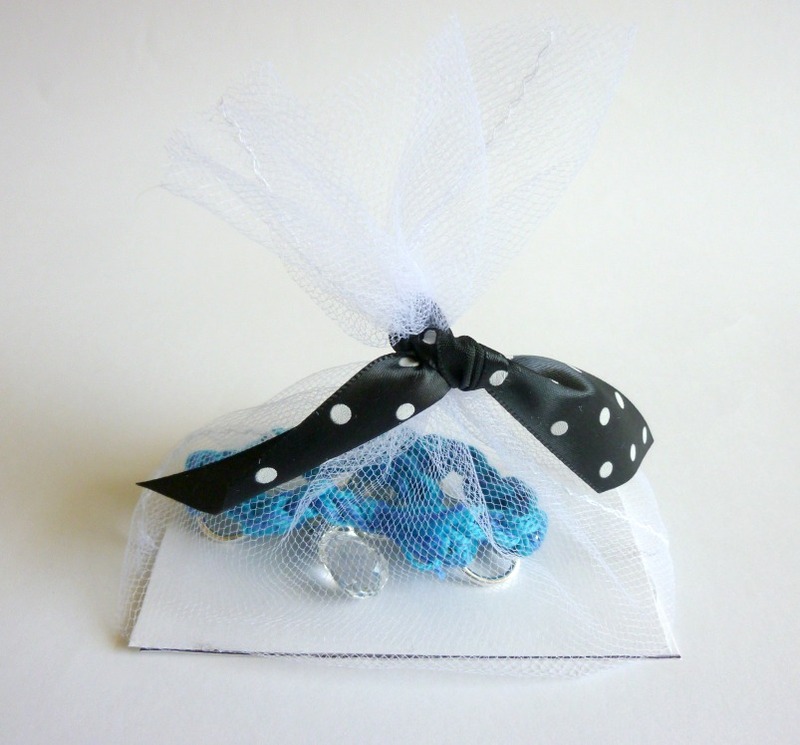 If you don't have a button on your site already, it's really easy to make one yourself! I used THIS tutorial from Code it Pretty. It was simple and fast and I was able to make it work, which is 100% better than all of the other tutorials that I tried (and failed at!). Ideas? Opinions? Anyone done this before? I'm still learning, so any/ALL feedback you can give me would be amazing. Okay, I'm off to enjoy my cold and rainy Saturday. Hope your weather is nicer than mine is, and that a stranger tells you you're pretty today! 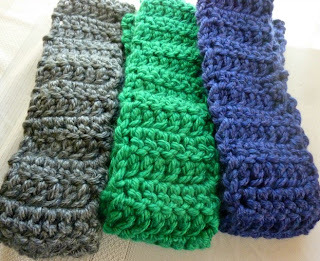 I got the most wonderful letter last night from my friend Darlene asking me about easy cowl patterns. 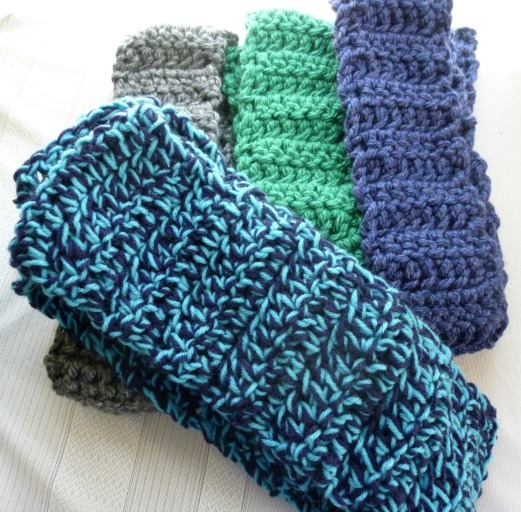 She was working on some scarves for the homeless outreach program that I am a part of, and wanted to make some simple cowls to add to her donation. Woo hoo!!! Awesome, I'm all over that. 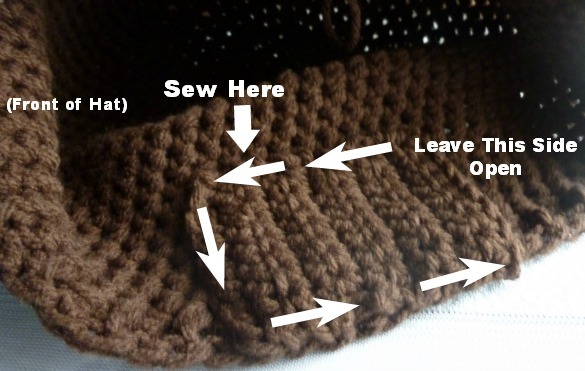 Since I don't have any cowl patterns on my site, I told her that I'd look around and see what there was out there. 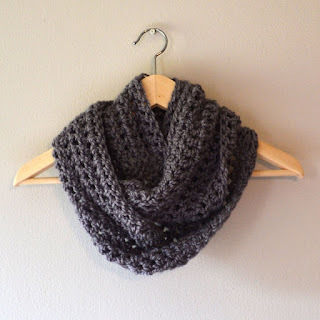 I love this Hour and a Half cowl at NaturallyCaron. It works so quickly because you use four strands of worsted weight yarn at a time and a U hook! Awesome! It's only 22 stitches per row! 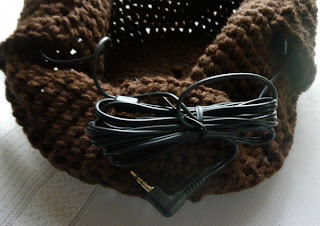 Stephanie at The Crimson Owl made the most beautiful convertible cowl that has a hood! 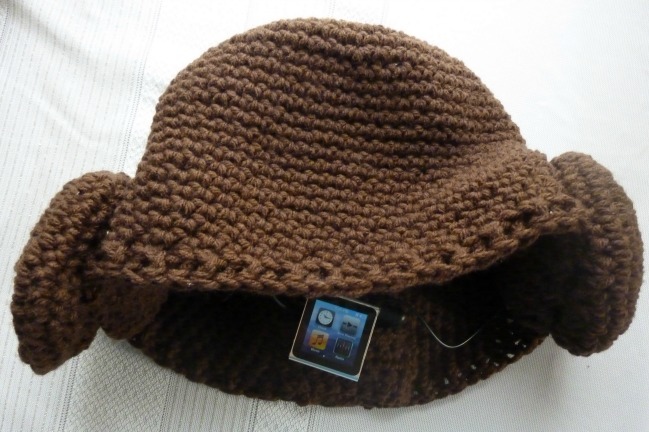 She designed it for a beginner class that she taught, so you know it's easy, but it's so awesome EVERYONE (even advanced and adventurous crocheters) is going to want to make one!!! 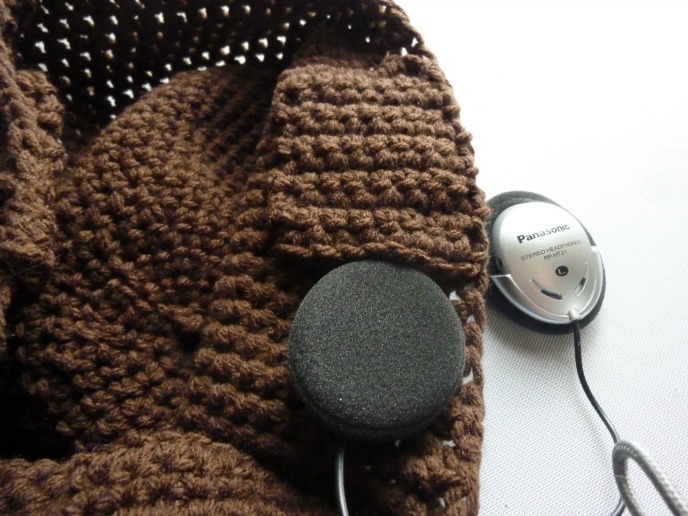 Liz at Crochet In Color accidentally made this gorgeous chunky-yarn cowl instead of the poncho she started! Her story is cute, and the cowl is amazing, and very easy and looks like it would work up quickly. 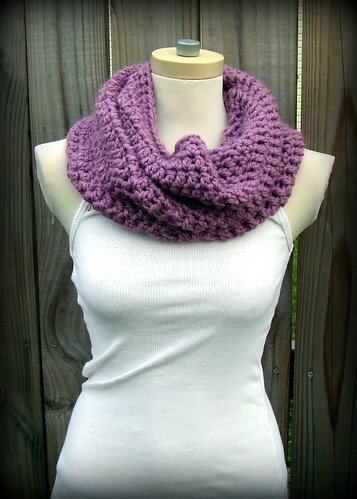 Jay over at Jay's Boutique Blog has this delightful Light n Lacy Cowl pattern. She uses my awesome stitch the scarf together at the ends technique (see guys, it's really a thing!). 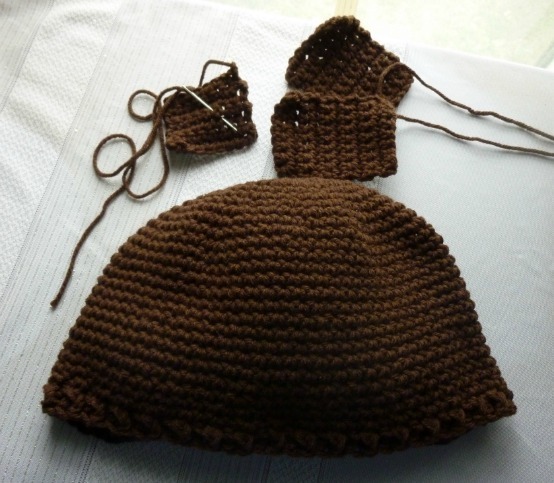 And since it doesn't even use a whole skein of yarn, you know it's going to be quick to finish! 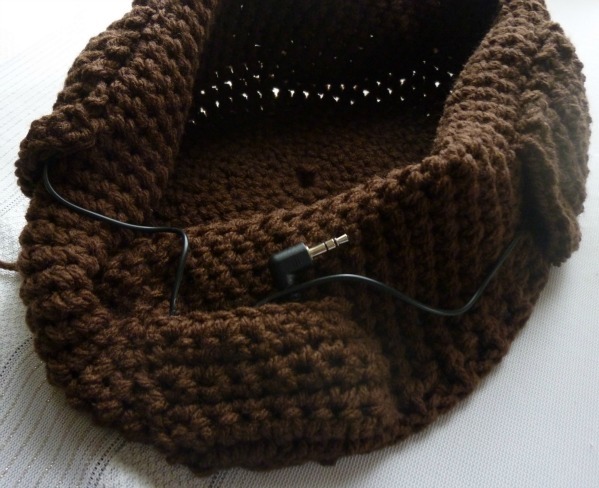 So now that I've spent the last hour looking at cowls I'm all inspired to make one of my own. Hmm. 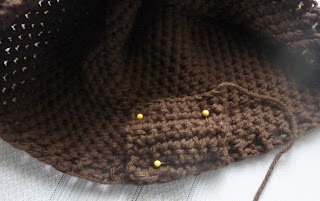 There will be a Dynamite Cowl coming soon... But in the mean time, do you have a favorite cowl pattern that you always use? I know there are a ton of patterns out there that I didn't see on my shallow Pinterest search... Feel like sharing? 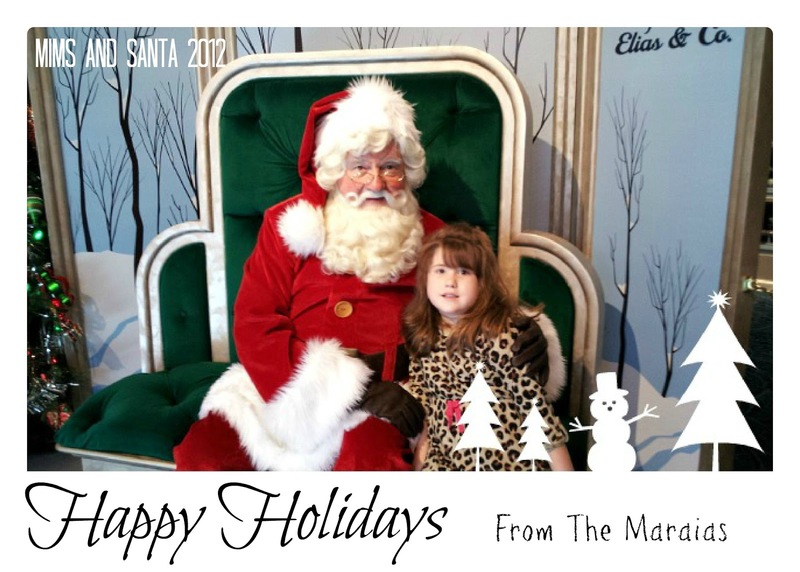 Okay, so imagine that I had remembered that I needed to make holiday cards, had sent them to a printer, and got them addressed and mailed in enough time that they arrived in your mailbox this morning (I know there's no mail service today, but play along). Now look at the picture again. Ah, fills you with the warm glow of knowing that you're loved by all of us over here, doesn't it? Yeah, that was what I hoped! I'm going to go play with all my new toys now!!! Have a really special day! Okay, so I am the first one to tell you that I'm a little disorganized. I'm a creative-type, not an everything-in-it's-place-type (I know that it's possible for some people to be both, but I am not). So I have no idea where I put our Christmas stockings from last year. I know, I know, they should have been with all of our ornaments and decorations, but they weren't. I was going to buy Mims a new stocking just to have it done and not have to worry about it, but when I went to the store I just couldn't bring myself to pay $25 for it, especially since I was just being lazy. I found THIS pattern over at RedHeart.com that I really liked, so I grabbed my hook and 2 skeins of yarn and streamed a documentary on Netflix. 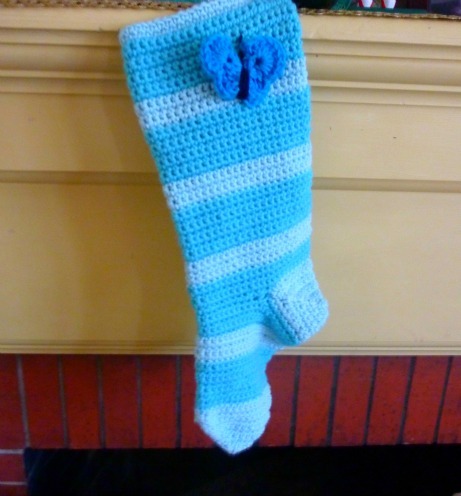 I wasn't done with the stocking when the documentary finished, so I put on another one. And then I watched a movie. 5 hours later, the stocking was done. It wasn't quick, but it was easy and it turned out really cute. I added a butterfly that I made with an I hook and worsted weight yarn. 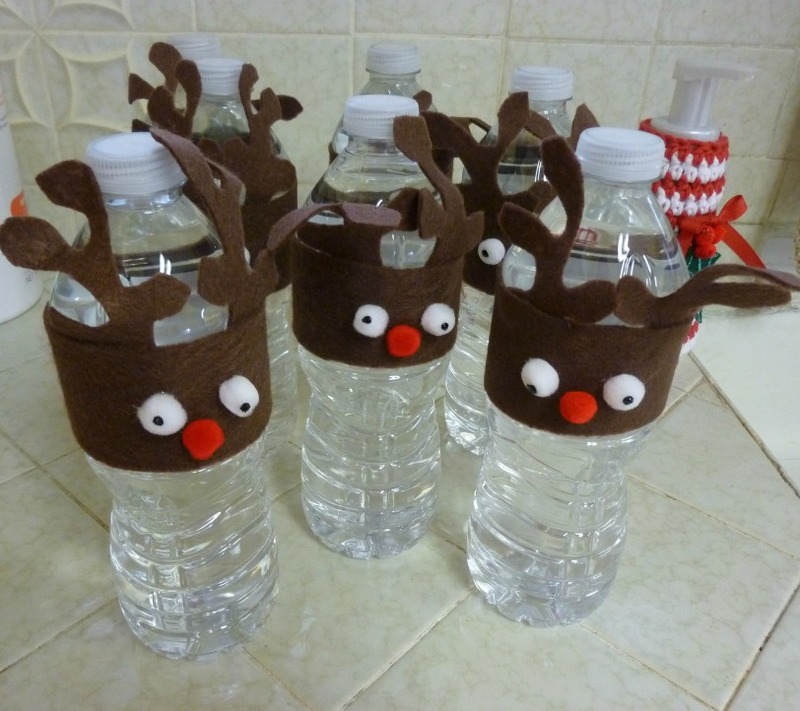 That got me in a crafty Christmas mood. 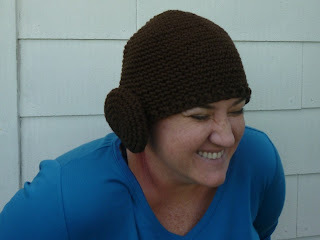 I saw THIS post over at Aunt Peaches (it's the Citizen Kane of craft blogs... Which I am so jealous of. I think I'm the Breakfast Club of crochet blogs... Milk WILL be made available...). 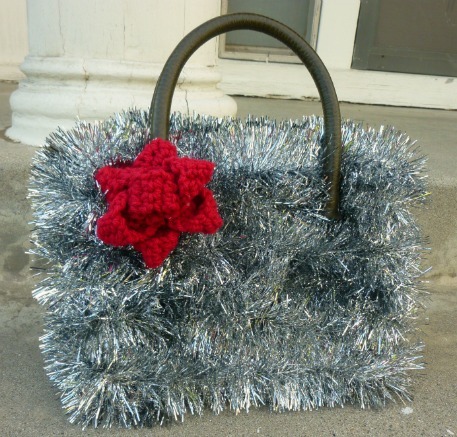 It's a tinsel purse. It's sparkly and fabulous, and I desperately needed one. Mine cost $2, because I got clearance Target tinsel instead of dollar store tinsel, but it was worth the buck to me to not have to go to another busy store... I grabbed a purse that I hadn't used in almost 2 years (see, disorganization in action! A normal person would have donated/discarded it by now.) and my trusty hot glue gun and decorated away! I added a Holiday Gift Bow for extra beauty. This picture doesn't do the purse justice. It's so blindingly sparkly, one might call it Disco-Ball-esque! And last (and least, because alas, it didn't include crochet) I made some Reindeer bottles for the carolers that came to visit us this year. They appreciated not having to eat another giant plate of cookies, and I appreciated that I could get them done in less than an hour with materials I had in my craft stash! Win, win! What kind of crafty fun are your guys up to today? You guys have heard me talk about the awesome work that my friend Kristy does with homeless/motel family outreach, and you know that I collect crochet donations for her program. Well, she came by the other day to pick up several boxes of donations (once again, THANK YOU! She is always so grateful and amazed at the love and compassion and generosity that you've shared with us this year!) and mentioned that there just weren't enough masculine items to keep up with the amount of men that needed assistance. She wondered if there was a very simple, very plain, very basic scarf that could be made in 'boy' colors so that she would have something to offer to them. Of course I can do that! I made a bunch for her, and (if you're interested) you can too! ...that last part was completely optional! LOL!! While Kristy was here we got to talking about the other things that she was trying to get donations for too. Toothbrushes and toothpaste, deodorant, coats, hats, sleeping bags, and my personal favorite, hand warmers! 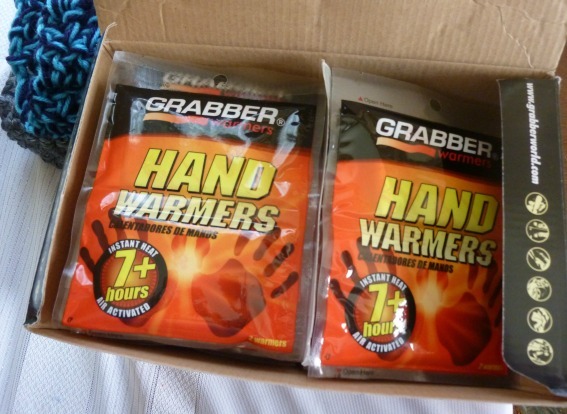 Did you know that you can pick up a box of 40 pairs of hand warmers (80 total warmers!) 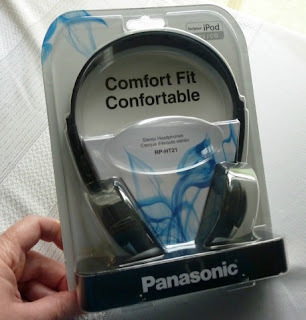 for less than $20?! Each warmer provides 7 hours of warmth in a sleeping bag, and that might mean the difference between a miserable night, and a good one. It was too awesome, I had to get her a box! 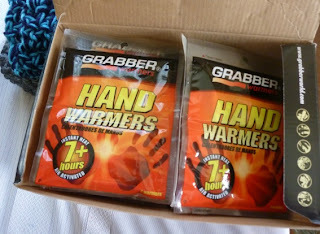 If you're interested, THESE hand warmers at Walmart.com are cheap and can make a real difference in someone's life. You can send them to me at the address above, or you can even have them sent to the Westminster, CA store! Free shipping for you, and she'll be so happy to pick them up! You can ship them in care of Kristy Belton Bleau (you can leave a comment or shoot me an email so I can let her know to look for them!). I hope I tell you all enough just how much your support and love means to me. I am so grateful for all of you lovely people who have become more than mere readers or followers, but true friends. I am sitting here getting all nostalgic and sappy (as this time of year tends to encourage), and just felt like I needed to say it. You are special, kind, wonderful, beautiful and perfect just exactly the way that you are. And I love you! Oooh! Today is your last chance to enter my Facebook contest to win a Princess Leia Headphone Beanie (just the beanie and headphones, not the iPod)! So, the latest copy of In Style magazine was pretty good. 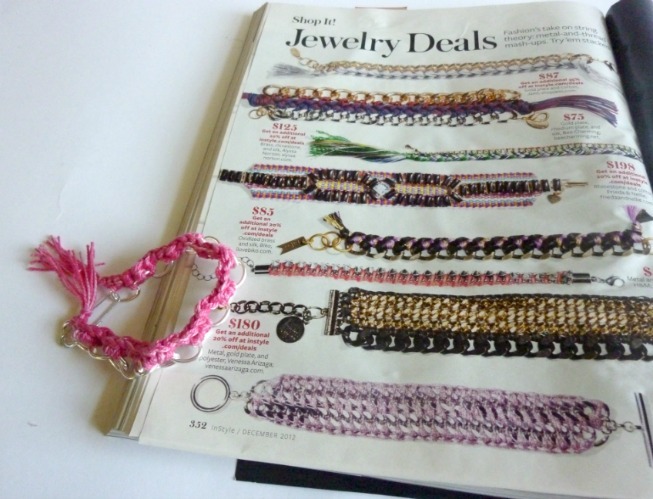 Of course, I could hardly contain my glee I flipped past a page and discovered that the embellished bracelets that have been popular in French Vogue were now everywhere! Yippee!! 'Cause, you know, we can do that ourselves! Anyway, I had to make one for myself. And then I had to do some more research. I discovered something very interesting. Aurelie Bidermann's Do Brazil line of jewelry is stunning. It's also very, very pricey. Have you seen it? 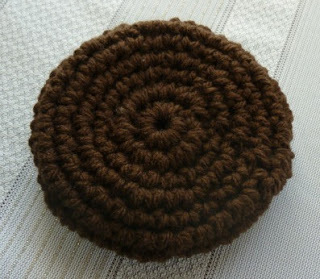 Craft Cord (sometimes called Craft Thread. It's like embroidery floss that doesn't split apart, and it's sold next to the embroidery floss in big bulk packs. 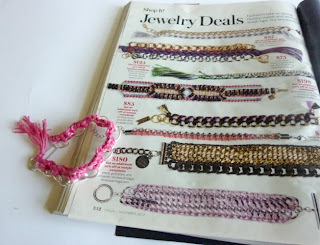 You could also use embroidery floss, or size 3 crochet thread.) I used 5 strands at a time for this project. These bracelets are meant to sit a little more snugly than most charm bracelets do, so I took two links out of the bracelet chain using my jewelry pliers. This isn't completely necessary, if you don't want to do this step. 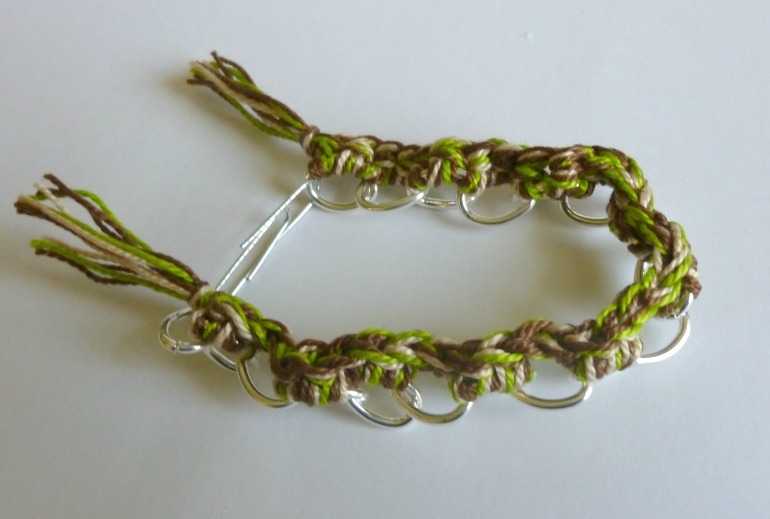 I began by pulling a loop through the first link of the bracelet, and chaining 2. Then I put 2 sc in each link across the top edge of the bracelet. 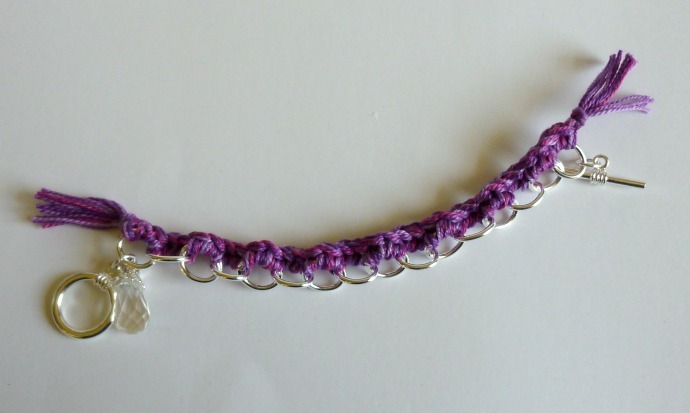 I think you can see in the picture that I alternated which way I held the links as I went, so that the bracelet wouldn't spiral when I was done. So one link came to the front, the next link I brought up behind the first link, the third link I brought up in front of the second link. 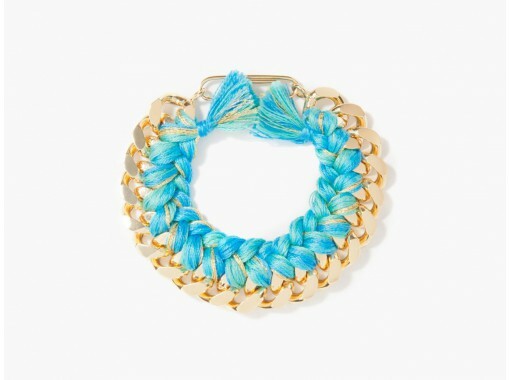 It gives a little bit of a ripple to the bracelet, if you look closely. 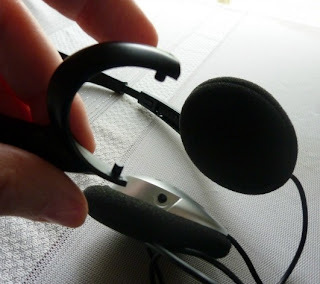 When you get to the end, pull the loop through to finish the end. Leave a 3" tail (just to be safe). Now, pull out a 6" (or so) length of the threads. Using your hook, pull one end of this strand through the ch 2 space at the front of your row of stitches. Pull the end up so that the strand is centered. 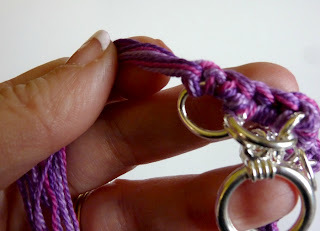 This is going to bulk up the tassel that goes at the end of each side of your bracelet. 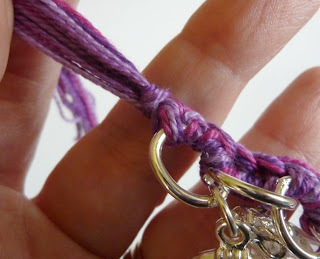 Wrap a few of the threads around the whole bundle of craft cord and knot it. Put a few drops of Fabri-Tac on the knot to keep it from coming loose. Repeat on the other side. Trim the tassels to approximately 1" long. Wrap it up and give it to a friend that you love for her birthday because she's awesome (not just because she wrote a beautiful review of your latest book on Amazon, but also because she's incredibly kind and generous too)! You don't have to separate the entire length of chain into bracelets, you can just use what you need and save the rest for something else, if you'd prefer. I was going to make a lot of presents, so I split mine up right away. 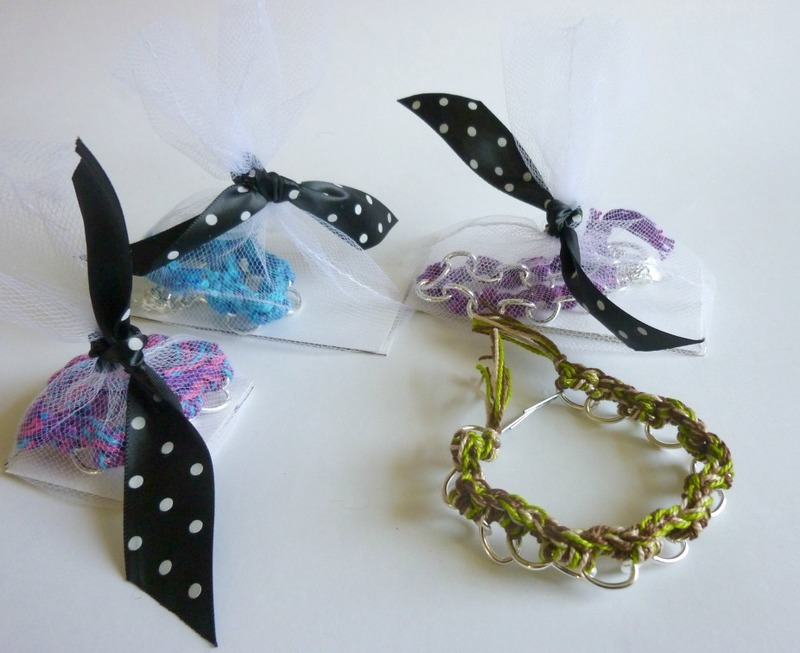 I got 5 adult sized bracelets, and one smaller bracelet for Mims. Attach your very clever closure. 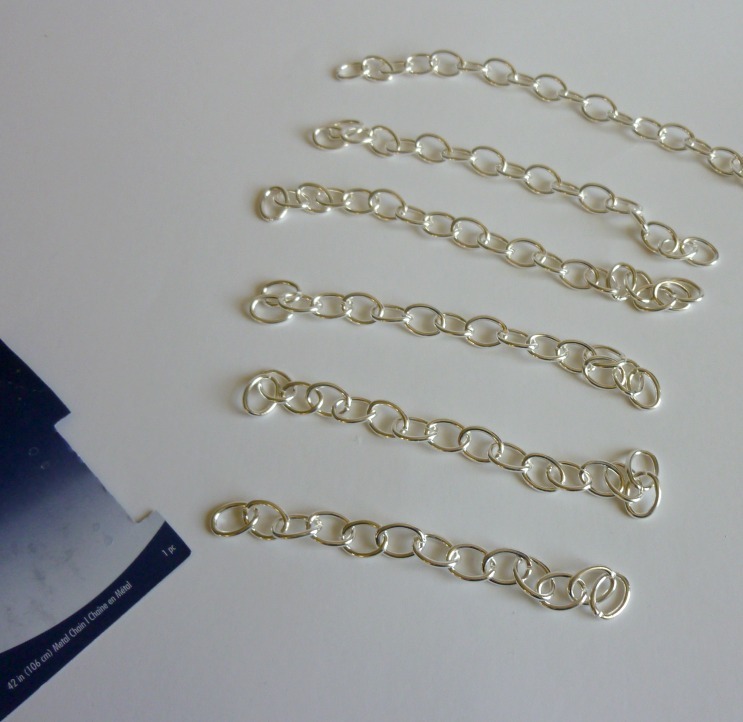 Now, follow the instructions exactly the same way as for the charm bracelet version! 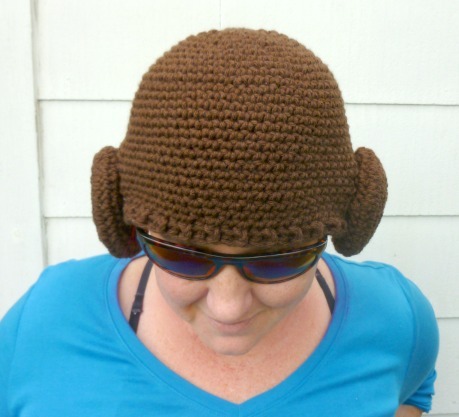 I made this one for my mom because it will make her laugh every time she wears it. You're all done! Package them up in cute little gift baggies and tie them with ribbon! Psst! You want to make gift baggies with me? 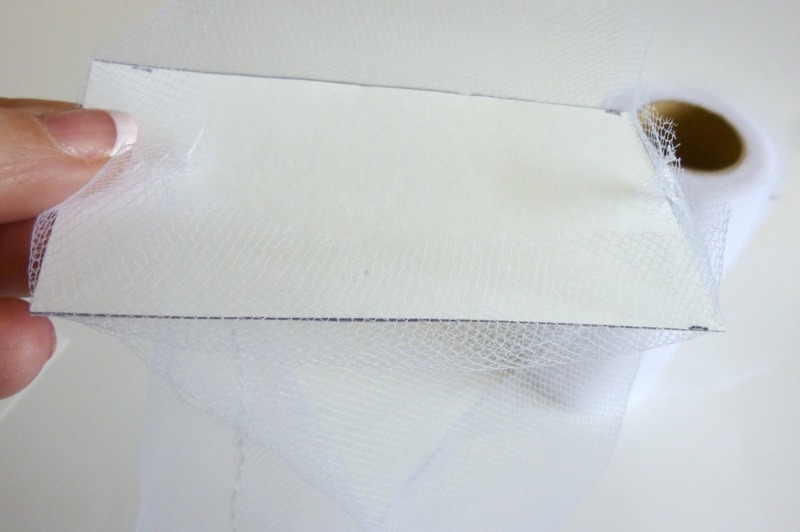 Start by sewing two 36" strips of tulle together along the long sides with a 1/4" seam. This will make a 36" tube. Turn it inside out, so that the seams are on the inside of the tube. Cut the tube into 9" lengths, or whatever length you prefer. Cut your card stock into 4"x2" rectangles. You need 2 for each baggie. 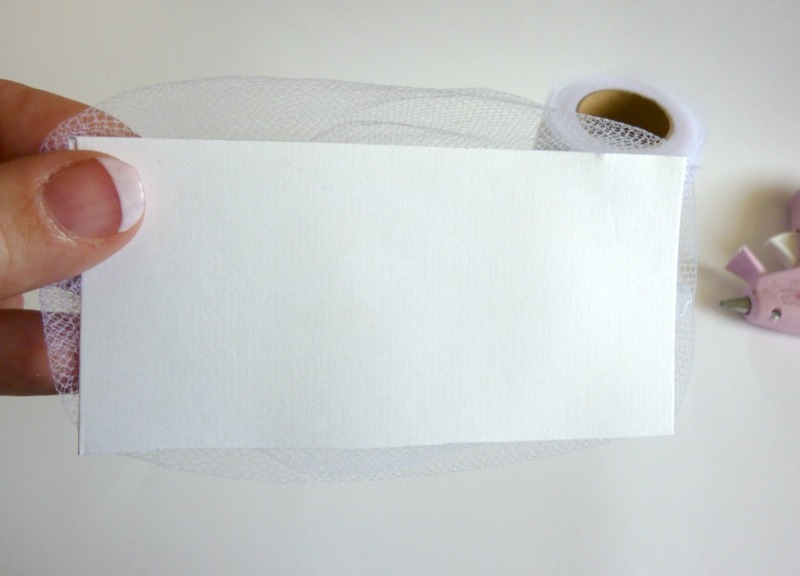 Slip one of the card stock rectangles into the bottom of a tulle tube. Make sure that the tulle comes up evenly on each side and wraps across the rectangle to meet (mostly) in the center. 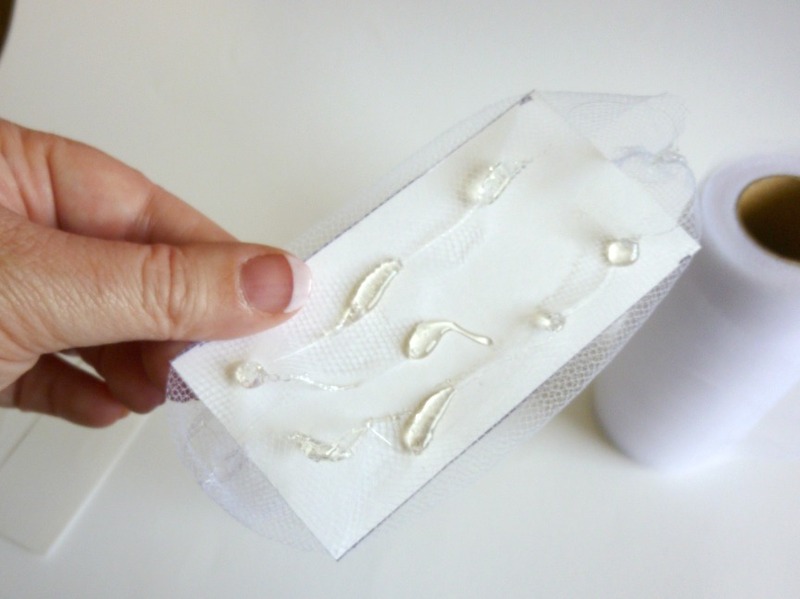 Squeeze a bunch of hot glue on the tulle and card stock. 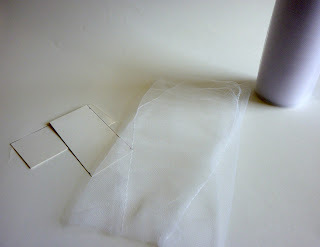 Slap another rectangle of card stock over the glue to make a tulle/glue sandwich. Add more glue to the corners to make sure that they're really stuck together.